Measure from the top of the shoulder down to the point where you want your choli to end. Measure at your navel & bring it around your waist to the front. The measuring tape should be parallel to the floor. This will be where you want your lehenga to sit. 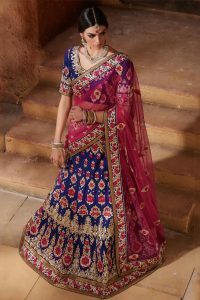 The lehenga is weaved together with embroidered floral motifs on the lehenga and the choli. Comes with matching choli and dupatta. The suit can be customised to fit bust sizes 32,34,36,38,40 (UK sizes 8-14) (Slight variation in colour, fabric & embroidery work is possible. Model images are only representative.) Model accessories and latkans are not included.